For top-notch tree removal and tree trimming services, depend on ALL STUMPS PLUS of Richmond, Virginia. We even provide 24-hour emergency services to remove downed trees. 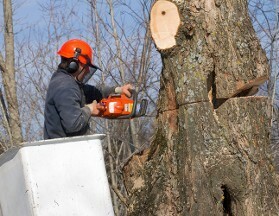 At our tree service, we gladly remove dying, dangerous, and hazardous trees from your property. If you have a tree that is leaning, one that is infected, or one that needs to be removed to ensure the safety of your building, you’ve come to the right place. Our crew uses a crane service, if it is needed, to bring down your trees in a controlled, safe manner. We use proper rigging techniques to ensure the utmost safety for you and your property. Insurance work is also available, and we work with both residential and commercial clients. 24-hour emergency services are available for trees that fall on structures and power lines, trees that have fallen or been damaged by a storm or other disaster, and broken branches that may fall and uproot trees. Contact us in Richmond, Virginia, to inquire about our highly acclaimed tree removal and tree trimming services.